Discovered a new hangover cure this morning: open water swimming. After a late night at a friend’s wedding (too much wine and dancing in heels… ouch my calves this morning), I surprised myself by making it to my tri group’s first open water swim session on time. The last thing I wanted to do was stuff myself into a wetsuit and jump in a lake. Getting the wetsuit on was a bit easier this time, though. Noa gave me a few pointers, such as to use BodyGlide around the parts your suit gets stuck, like your wrists, ankles, behind the knees, etc., and to cut off any extra suit length near your feet and hands if it’s too long. 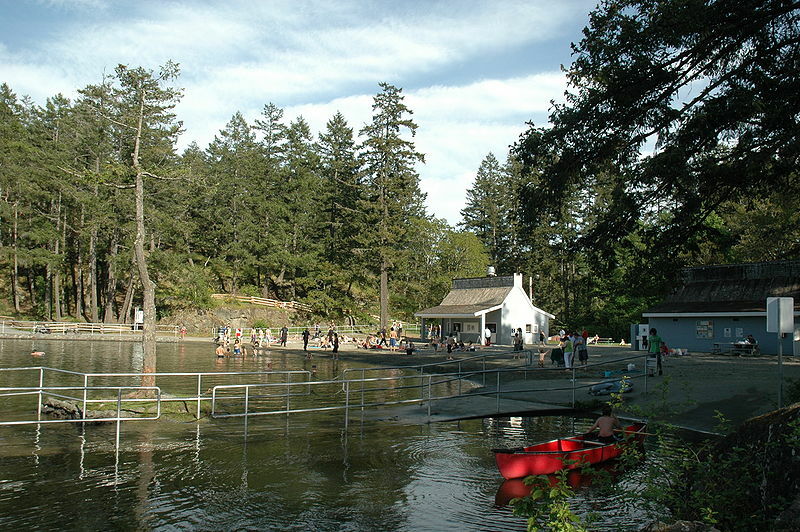 While the majority of the group did laps around the small islands in the middle of Thetis Lake, I stuck near the shore with a few others and practiced swimming out and counting strokes, and running in and out of the water. By the end of the swim I wasn’t feeling the effects of last night at all — in fact, I felt great! I felt I could have kept going, but we still had a run to do. Oh! I also got my tri team cycling kit (cycling kit = a bike bib and jersey with my tri group logo on it) AND bought some new kicks! Officially one of those spandexed riders I used to make fun of on the Goose. Woo hoo! I’ve been running in Mizuno Wave Inspires for about 6 months, and they’ve been great. 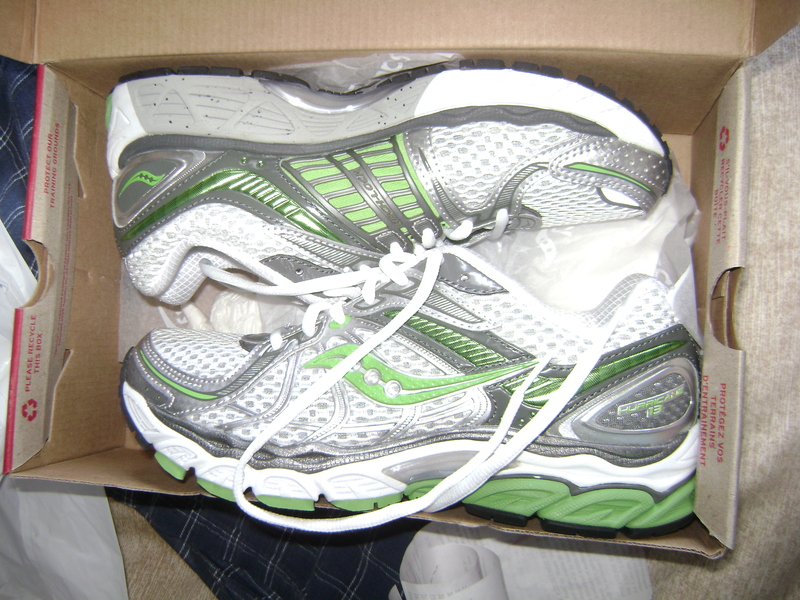 I tried on the same shoe in the newer version and wasn’t really in love with them. Not sure what they changed… but they definitely weren’t as comfy. I think they are a bit higher around the ankle than last year’s model. It was a toss-up between Saucony ProGrid Guide 4 (which had a bit of a higher heel to make you run more on your forefoot) and the Saucony ProGrid Hurricane. The Hurricane felt most like my current shoe, so I decided to play it safe and get them instead of the Guides. Saucony ProGrid Hurricanes. Will now run at a hurricane-force pace! Oh, and I also bought some swimming goodies. 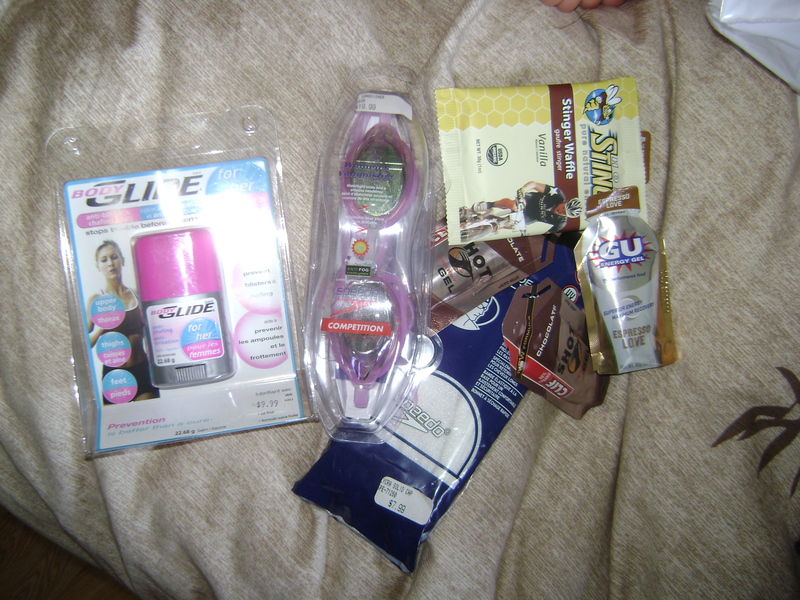 BodyGlide, new goggles, a new swim cap in white and chocolate & espresso gels for fuel. I’m still on the hunt for a new swim suit and a tri suit… and hopefully that will be it for triathlon gear spending for this season. I am finally in possession of the last expensive piece of triathlon gear I need: the wetsuit. Since most of my tri training group were racing today at the Subaru Victoria Triathlon (congrats to Adam and Leif by the way — first and second place overall! Amazing!) and I couldn’t get a ride out to Elk Lake to watch, I walked down to Langford Lake to test out the new wetsuit and go for a swim. I struggled to get into the suit for about half an hour. You have to be careful not to puncture the rubber with your nails; even with gloves on AND cut nails I think I still managed to put holes in it. I managed to get it a bit further on than I did with the help of Dave in the store, so I’m hoping next time I’ll be able to have it fitting properly. Getting your legs in is definitely the trickiest part — after it’s pulled up to a certain point you just pull your arms in, put your shoulder blades together and have someone zip you up, then you can kind of wiggle yourself in more by putting your arms over your head and bending at the hips, and doing high steps and squats. Once I got in the water it was awesome. I was nice and warm, and the wetsuit makes you super buoyant. The hardest part for me once I started swimming was trying to blow bubbles in cold water (the cold temperature makes it harder to breathe at first) and being freaked out by seeing a dark, murky abyss instead of the bottom of a pool. I had to stop and pop my head up often to make sure I wasn’t swimming off into the weeds and that I could still see the shore. I think next time when I’m with a group and not alone in the water I’ll feel more comfortable. But yay! My first open water swim! 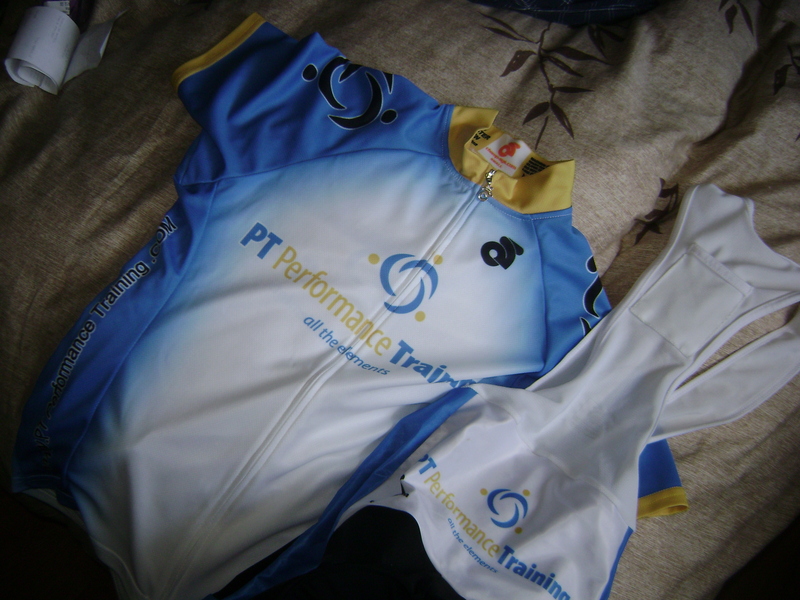 All that’s left of unchartered tri territory now is the transition. My YouTube debut. Thankfully, Dave was nice enough not to film me walking. So it turns out I did actually tear a calf muscle. At the insistence of Kirsty, I went and made an appointment with Dr.Mike to get it checked out. That was my first time going to see a specialist for anything sports-injury related, and now I know why Kirsty didn’t tell me much about what to expect. Active Release Therapy HURTS. Dr. Mike busted out this metal spatula device and started scraping my calf, like one might try to scrape the blackened burnt part off a piece of toast. But more violently. Then he dug his thumb right into the torn muscle and asked me to FLEX my foot, which is something that hurt to do anyways, let alone with a thumb digging into the muscle. “Go go go go go! 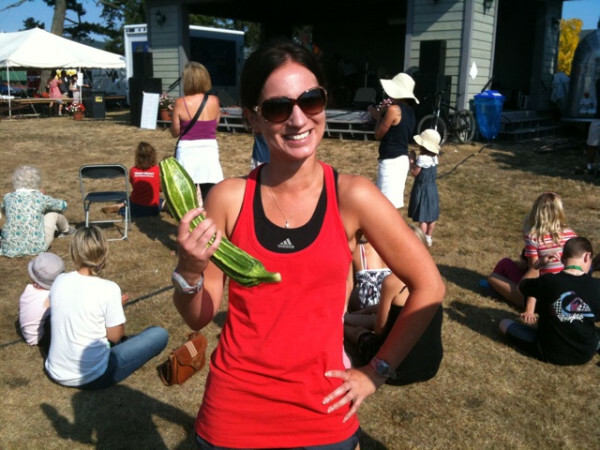 Pull pull pull!” I felt like a Biggest Loser contestant at the mercy of Jillian Michaels the way my face was contorting in pain. But then I hopped off the table, and I could walk without a limp. I had zero pain in my calf, and haven’t felt pain in it since. Dr.Mike works (painful) miracles. A few other pointers he gave me: You started out to fast. Get a coach, train properly. Six half marathons in one year is too much. No running for two weeks. 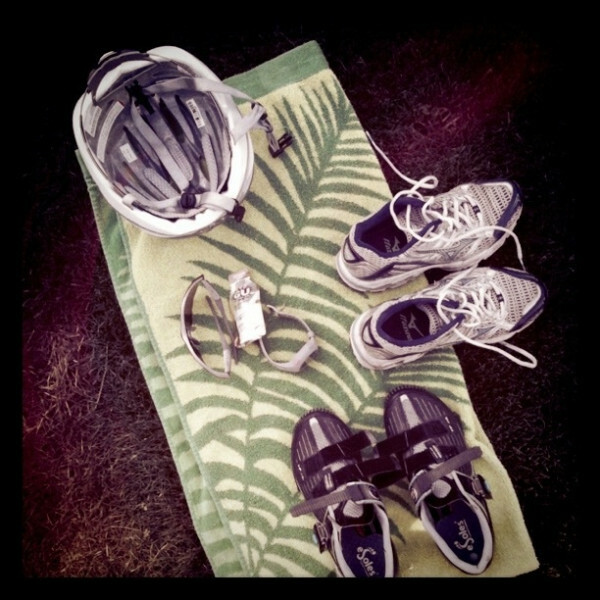 Take up swimming and do some light cycling. You should be good to go for the Bear Mountain 10K in November (yes! — that’s all I needed to hear). So now my plan is to join a marathon running group and a triathlon club in January. I also need to take swimming lessons and get a proper bike. 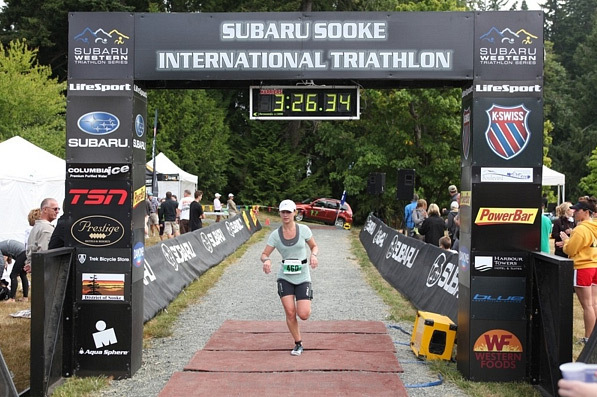 I signed up for the Gunnar Shaw as well, an off-road 10k at Thetis Lake in November that takes you through mud pits and freezing lake water (already bought some sweet trail running shoes for this adventure from MEC! 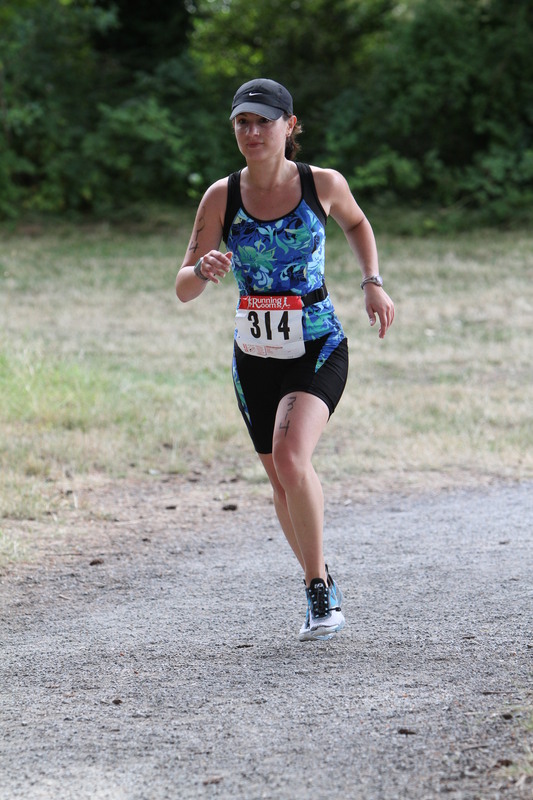 ), and have my sights set on doing the Island Race Series and another marathon in the spring. Nothing helps to heal a running injury more than coming up with a new action plan — well, to help to mentally heal, anyway.